This is the first in a series of videos culled from an interview about content marketing I did with Terry Foster of Cision Canada. Cision (the USA version) is also a sponsor of Convince & Convert and our Social Pros podcast. (here’s a post I wrote about their nifty content amplification tool). Terry: Let’s talk about content marketing. Content marketing is gaining momentum as a communication strategy. How important do you think it is for communicators to go down that road? Jay: Well, it’s funny because it is gaining momentum, and I wonder if it’s gaining momentum because it’s new or because people are just thinking about it differently? If you take a step back, we’ve been making content forever. If you have a tractor company in Alberta that made calendars for farmers 100 yeas ago, that’s content, right? But now we’ve sort of thought about it, not so much as an edge case, as a give away, but as a foundational marketing tactic. 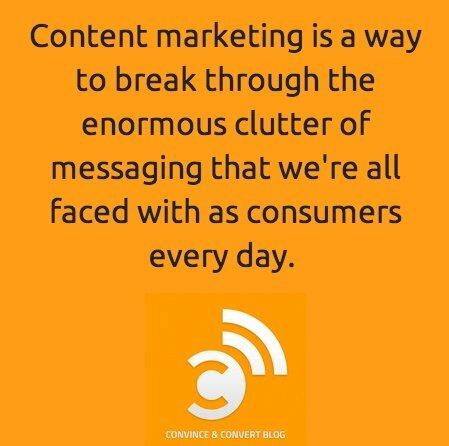 That’s because the old ways, the interruption marketing ways simply don’t work the way they used to for a lot of different reasons, and so content marketing is a way to break through the enormous clutter of messaging that we’re all faced with as consumers every day. Terry: Do you think content marketing is a right fit for every brand? Jay: I think every brand has the ability to be useful. I think every brand has a story to tell. I think every brand has knowledge that their customers and potential customers could really benefit from. I don’t, however, think every brand is culturally ready to embrace content. If you’re going to do it right, it has to be content that has real value. Otherwise, what you end up with is a brochure, but you just call it content marketing. Terry: Yeah. So how do you define value in terms of content marketing? That doesn’t mean that you can’t create content that doesn’t meet that standard, but I think that’s a good test to apply day-to-day. Subscribe to our One Thing email to be notified when the next video in this series is published.